In the latter part of the twelfth century, the Church had fallen on evil days, and was weak and spiritually impoverished. It was then that Francis of Assisi renounced his wealth and established the mendicant order of Franciscans. At the first gathering of the order in 1212, Francis preached a sermon that was to make a radical change in the life of an eighteen-year-old young woman named Clare. 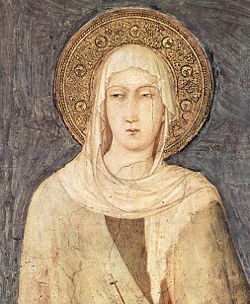 The daughter of a wealthy family, and a noted beauty, Clare was inspired by Francis’ words with the desire to serve God and to give her life to the following of Christ’s teaching. She sought out Francis, and begged that she might become a member of his order, placing her jewelry and rich outer garments on the altar as an offering. Francis could not refuse her pleas. He placed her temporarily in a nearby Benedictine convent. The order’s practices were austere. They embraced the Franciscan rule of absolute poverty. Their days were given over to begging and to works of mercy for the poor and the neglected. Clare herself was servant, not only to the poor, but to her nuns. This excellent biography might be improved by adding “, often simply known as “Poor Clares”. do all churches observe saints days . from what i understand they are only observed by people that saint has a special meaning to ie St.patricks day for irish people St. Amdrew’s for scottinsh people or St. mathew’s day for accountants . Alexi, Thanks for your question. Next time we need your last name, too. — Ed. In response to your question, churches have different practices of observing saints days. It’s common in the Episcopal Church for parishes to celebrate a eucharist (communion) that commemorates a saint, though most churches don’t have a daily celebration, so they don’t commemorate all the people on our calendar.